Friday I took my first yarn spinning lesson from my friend Tara. Tara is one of those quintessential yarn experts. She has raised her own livestock, sheered, prepped and spun her own yarn, woven and knit said yarn, and studied and taught all manners of yarnie crafts. AND, if that wasn't enough, she's also developed the most authentic Doctor Who Scarf Patterns you can find - going so far as to travel to England to inspect, color match and measure original scarves to develop patterns after. But, I digress. We started with building our own tools. We sanded dowels and drilled pilot holes, screwed in cup hooks, then assembled top whorl spindles. Tara explained the history of spinning... beginning where the caveman began. (Did I mention I love learning origins!?!) And then the fun began! We worked for about 3 hours on this lesson. Above you see my first spindle with my very first yards of single ply. Tara wisely advised me against letting my perfectionist take over, handed me bat for homework and sent me on my way, anticipating I'd be clamoring for my plying lesson by the end of the weekend. 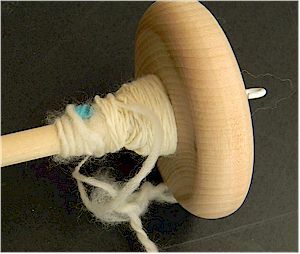 There is something incredibly addictive about hand spinning. Maybe its the rhythm of it, or the quiet mind that takes over and lets you daydream about what wonderful creation this fresh new yarn will become. I equate it to knitting in the round... you just can't stop, and will pass many hours in short time. If you have ever had the inclination to learn it, please follow up. Even if you never complete a full skein, just to know the history and understand the work and process that goes into making that wonderful material is worth it. You'll come away ever more enchanted. New Pattern Coming... A Shawl! !